I was able to travel throughout the entire Metro Manila area in 30 minutes. I’m not kidding, I really did. When I say Metro Manila, I mean from Pasay City to Manila Bay to Makati City through EDSA going to Quezon City to Caloocan City to Manila Bay and back to Pasay. I travelled for 30 minutes over the metropolis via a charter flight of Philjets Aero Charter Corp. under the Philjets Group, a charter service venture of Filipino, French and Cambodian businessmen. This charter flight over Metro Manila is part of Philjets' recently launched tourism and leisure services; they call it Manila Discovery. As a regular commuter in Metro Manila, I feel nothing special about the tall buildings and most of all, the notorious traffic situation in majority of the thoroughfares in the metro, specially the circumferential EDSA (Epifanio Delos Santos Avenue). But the Manila Discovery tour package gave me a different view of the National Capital Region. It was a cool experience to fly over skyscrapers in the central business districts (CBDs). 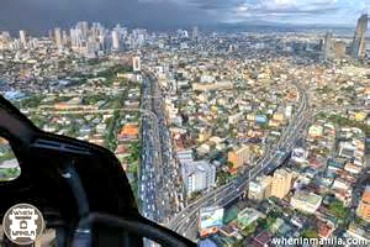 Makati’s skyline was the best attraction for me during that helicopter ride. Not too far from Manila, Philjets also caters charter tour in Corregidor. Fly over Manila Bay and gaze at the ruins of Corregidor Island, the bastion of allied forces during World War II. See the lighthouse and hospitals destroyed by enemy warships, then head to Fort Drum on El Fraile Island. You may also opt for a land tour in Corregidor. Planning for your summer vacation in Batangas? Avoid the long queue at the tollgates of South Luzon Expressway (SLEX) and have a longer time for your leisure as Philjets can carry you to Punta Fuego. Its charter service will cut the two-hour drive from Manila to Punta Fuego to 30 minutes. During the flight, witness Manila Bay and Kawayan Island as well as the beauty of the terrain in the Calabarzon (Cavite/Laguna/Batangas/Rizal/Quezon). Enjoy an overnight escapade in Punta Fuego and return to Manila via charter flight as well. Want to see the "volcano within a lake within a volcano?" Yes, I’m refering to the Taal Crater Lake. Philjets’ charter flight can fly you over Cavite in Southern Luzon for you to have a different view of Taal Volcano. Also have a sightseeing above the agricultural landscapes and green fields of the province before reaching Tagaytay City. You may also want to dine in at Antonio’s Restaurant in Tagaytay -- the first Filipino resto to be in the list of 50 Asia’s Best Restaurants 2015. Now, why not head up north? Fly over the Mount Pinatubo in Central Luzon and gaze at the breathtaking scenery of the mountain and its emerald green Crater Lake. Up in the air, see the new shape of this gigantic mountain after its destructive eruption in 1991. Philjets’ charter flight tours and packages also include the Banaue Rice Terraces. Make your eight-to ten-hour drive to the Cordillera an over three-hour flight. Enjoy the view of the famous UNESCO World Heritage site, the breathtaking region of the Cordillera and scenic view in Sagada. You can also land on Banaue Hotel or directly head back to Manila. In an interview, Philjets Group Managing Director Thierry Tea said tour and package services of the company aim to exhibit a different view of the Philippines, attracting tourists and bringing them particularly to areas that are hardly reached.